In MOCAK Bookstore you can now buy the book from the Director’s Choice series devoted to the MOCAK Collection. The series by the London publisher Scala Publishing House presents the most important museums in the world through a selection of exhibits from their collections. 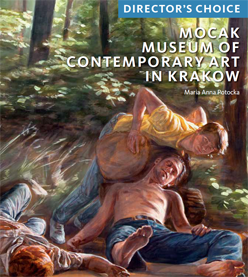 MOCAK appears side by side with such institutions as the Albertina in Vienna or the National Gallery in London. The English-language publication covers 37 works. The book is available in international bookshop networks and all major international exhibition institutions.